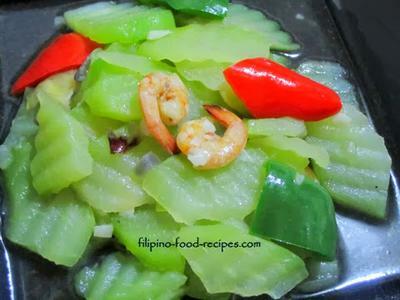 Ginisang Sayote is one of the popular vegetable dishes in the Philippines since its cheap especially when in season. Imagine, you could serve dinner with 3 pieces of sayote for 10 pesos(2014 prices), plus they are a good source of vitamin C, amino acids and dietary fibers. Chayote or Sayote a pear shaped fruit, with coarse wrinkles, has a fairly bland taste. Its flesh are firm and without brown spots when fresh and it is grown in cold areas in the Philippines specifically in Baguio and the Cordilleras. A very easy to prepare dish that could go along with any Fried Fish or Meat, just saute in garlic, onion, meat or shrimp, and season with a little bit of Fish sauce or Patis. 1. In a little oil, saute the shrimps until it changed color, then set aside. 2. Using the same pan, saute the garlic and onion in oil. 3. Add the chayote and fish sauce and saute for a minute. 4. Pour in the water, add the shrimp cube and simmer until the vegetable is soft, yet firm. 5. Add in the bell peppers and the cooked shrimps and bring to a boil.